Washington Lake Park was home to some new residents this year with the installment of three bluebird houses, as well as the introduction of milkweed to attract monarch butterflies. Through the efforts of the Washington Township Environmental Commission, Gloucester County Nature Club and New Jersey Bluebird Society, the park had a successful first year. According to Gloucester County Nature Club member Suzan Preiksat, this spring, approximately 30 native milkweeds were planted in the community garden, as well as in the park’s greenhouse to propagate more. The milkweed attracts the monarch butterfly, whose population has declined 90 percent due to the increased use of pesticides. Since monarch butterflies exclusively lay eggs on milkweed, the plant is extremely important in the butterflies’ survival. Preiksat, who has about 1.5 acres of milkweed in her yard, said she personally raised close to 290 butterflies on her front porch this year in her homemade, screened in rearing towers. Once they transform into the orange, white and black butterflies, she’ll take them out to her garden where they live to nectar. 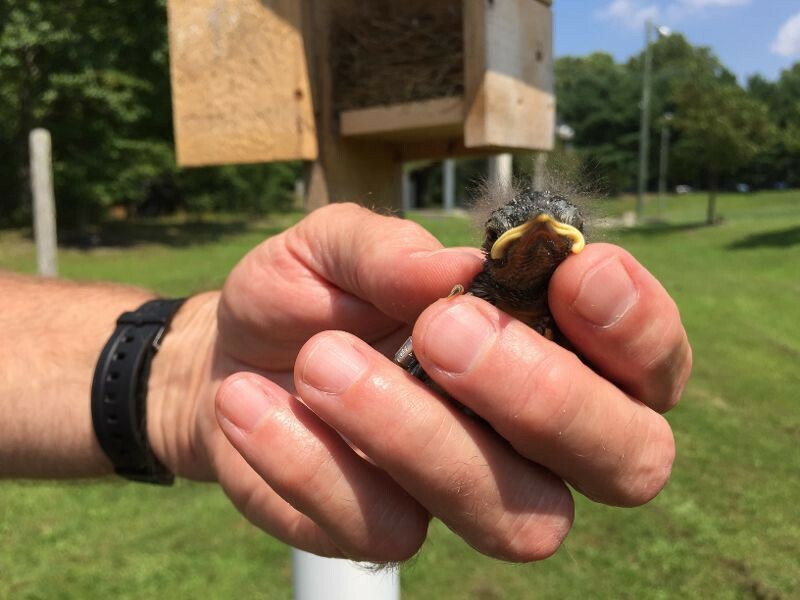 Much like the butterflies, Dave Gilcrest, Gloucester County coordinator for the NJ Bluebird Society, said bluebird houses within the park benefit the overall bluebird population, which has been affected through the years due the changing habitat. According to Gilcrest, similar to the exclusivity of milkweed for butterflies, bluebirds only nest in cavities, such as holes within trees, but they are constantly competing with other cavity nesters who will try to force bluebirds out. “By putting bluebird houses out and properly monitoring them, it gives them a better opportunity to nest, produce offspring and encourage numbers of population to increase,” Gilcrest said. In April, members of the NJ Bluebird Society determined three locations within Washington Lake Park that would be promising for bluebird houses, as they need to be about 100 feet away from wooded areas, with low grass for feeding and a nearby spot for perching. According to Leon Lakritz, chair of the Environmental Commission, the bluebird houses are located near the Greentree Road park entrance, parking lot G and not far from the amphitheater. Preiksat volunteered to be a monitor for the bluebird boxes, a crucial factor in the success of the bluebirds. According to Gilcrest, monitors will check the boxes every five to seven days to see what activity has taken place, and determine if there are bluebirds nesting or intruding cavity nesters. Each visit, the monitors will take notes and record their findings. Of the three boxes posted in the park this year, bluebirds successfully nested in two of the houses, resulting in four bluebirds fledgling, meaning they grew to fly away on their own. When a bluebird is hatched, it is banded with a serial number, registered within a federal database that is unique to the bird and its nest. This has to happen between the age of 7 and 12 days old, Gilcrest said, to ensure the bird is big enough to be banded, but not big enough to prematurely fledge. “If you band a bluebird and they are recovered or captured by someone doing research, they’ll know exactly where the bird came from, how old it is, how far from the location it was born, its health, diet and more,” Gilcrest said. While some bluebirds migrate for the winter, some will stay in New Jersey year-round. Unlike the bluebird, the monarch butterfly has an extensive journey to fly south in the winter. According to Preiksat, butterflies who formed in mid-August will live long enough to fly to Mexico, some traveling thousands of miles right over the Gulf of Mexico. Those who make it will stay until spring when they’ll fly back north to Texas and surrounding southern states. There, they will lay their eggs and die. When their eggs emerge, they will fly further north, lay eggs and die. The cycle continues through three to four generations, Preiksat said, before they hit Canada to turn around and migrate back down. According to Binetti, through community engagement activities and environmentally conscious projects and events, the Association of New Jersey Environmental Commissions recently awarded the Environmental Commission with the Environmental Achievement Award on Oct. 13. As well, the commission was notified on Oct. 16 that the Sustainable Jersey Program has certified Washington Township as a Sustainable Community. For more information on the Washington Township Environmental Commission, visit www.townshipnj.com. To learn more about bluebirds, visit www.njbluebirdsociety.org. Also, find upcoming events and projects by the Gloucester County Nature Club at www.gcnatureclub.org.